Stroud’s Daniel Cooper, the former 125 British champ who now focuses more on the pure roads series including the TT and North-West put his recent injury issues sustained at the North West behind him. He took first the Phoenix Open and then the King of Combe Race on his BMW S1000R. Cooper batted both times with young British Superstock runner Ben Godfrey on his brand spanking new LED Solutions BMW. The pressure that Godfrey applied to Cooper in the Phoenix open prompted Cooper and the team to splash out on a new rear tyre to find a bit more grip for the feature race. Godfrey wanted that King of Combe title, and despite never having been to the 1.85 mile Castle Combe circuit tracked and learned from Cooper a two-time winner of the circuits prestigious title. By mid race Godfrey set a new outright NG lap record for Combe at 94.17mph. But even that was not enough to get the better of inch-perfect-Dan who put in a series of near lap record laps to drag away from the youngster eventually taking it by just over two seconds. Each time James Kiff who hasn’t raced for over a year rode his evil handling ZX10 into third place. Cooper also took Sunday’s Powerbike final, again from Godfrey and Kiff with series leader Roo Cotton who keeps his championship lead in a healthy state. Saturday’s Powerbike winner Dale Thomas was ruled out of Sunday’s racing after a crash in Saturday’s open that saw three riders injured. Cooper not only raced the big BM but also had a Turner Racing TZ250 an ex-Tito Rabat Moto 2 bike for the 600 open, again in Roger Turner’s colours. He raced the TZ on Saturday taking seventh after starting from the back of the grid, but the immaculate Yam stayed on the stand on Sunday as Cooper concentrated on the fourstrokes. The stiff Moto 2 bike was not ideally suited to Combe’s lumps and bumps but “the Cooper effect” made up for that as the he headed home Josh Day on his 118bhp eight year old R6 across the line. Testament to Josh the 2016 600cc championship leader though as he hung on to Coopers coat tails and set a new class lap record on the ex-Dale Thomas R6. Sam Thompson was third on his 675. Thompson took second on Sunday as Josh crashed out early doors allowing his title rival Max Symonds to grab third. Max had struggled manfully all weekend with a misfire meaning poor qualifying positions, but eventually the issue was traced and we had the old Max attack on Sunday afternoon. The result was a stunning fourth place in the King of Combe up against the 1000cc metal on his ZX6R, a feat that earned him the Clive and Pam Flood Performance of the Meeting Award. 250GP and 125GP ACU National Championship. After qualifying down in fifth position, it looked like reigning champion and number one plate holder Phil Atkinson was going to be in for a tough weekend. But as Saturdays final got underway Atkinson jumped into an immediate lead taking over two seconds out of his rivals in the first lap with Tommy Lawlor, Ant Hodson and Dan Jackson giving chase. Hodson’s run of bad luck continued as his TZ failed after just two laps. Atkinson pressed on and by the flag built up an 11 second lead over former champ Jackson and Dave Hampton who fought his way through after a sluggish start to grab the third step on the podium. Sunday saw Hodson out for revenge and looked as though he finally had the measure of Atkinson, then the unlucky fairy’s wand tapped on Atkinson’s shoulder as his bike started misfiring, losing him over 5 seconds. But then the bike chimed back in and he set about catching Ant, a feat he did with one lap to go. In the post race chat with Larry Carter he said this thought was “….if it’s gonna break, let it break !! !”….but it didn’t and Phil and his Declans racing TZ took his third double of the year. Arnie Shelton took another double in the 125GP class on his John and Linda Pateman Racing RS125 Honda keeping his 2016 unbeaten run going. He certainly did not have it all his own way as Stephanie Waddelow pushed hard, and was ahead of Arnie for most of Sunday’s race. But Arnie grabbed the lead on the very last lap to deny Stephanie the win. Glen English and Chris Firmin shared the wins this weekend. Saturday’s race went to English on his SCC works Manx Norton after a five-way scrap that lasted the full 8 laps. English, Firmin, Alex Sinclair, Dean Stimpson and series leader going into the weekend Michael Russell took the flag covered by just over to seconds. Sundays race saw a dominant display from “Firmin the Fireman” who runs under the number 999, winning by over four seconds from Michael Russell who had a fight on his hands to keep his series lead intact. Sam Clews had his best race of the year taking third ahead of Alex Sinclair. Saturday’s winner English was sidelined with a broken Manx on Sunday. Mike Wilson got the better of runaway series leader Josh Singh in the Formula 125 class as he took a double win on his CLV/Graham File RS125 Aprilia. Greg Maden usually goes better in the wet than the dry, but he took the GP45 double in dry and sunny conditions on his 450 KTM heading Tony Bridgefoot both days. Tim Bradley and Ben Harrison shared the honours in the F400’s with Harrison overjoyed with his race though from the back of the grid after his throttle cable snapped in the qualifier. Bradley, the defending champ leads this years series by a massive 120 points over Simon Wilkins who elevated himself to second in the series with two good outings on his FZR. Harrison was enjoying a rare 2016 outing (….due to him changing jobs and working weekends !!) and clicked with the Combe circuit taking the first 500cc final by almost 45 seconds on his Up the Duchy ZXR400, but was denied a double after trackside marshals reported that his bike was smoking. The black flag came out and a frustrated Harrison pulled in, leaving the way open for Dave Hampton on the 450 Tigcraft to take the 25 points getting his championship challenge back on track after two no scores from the last two rounds. After not having swung his leg over a race bike for two years Justin Garrett took double win in the Mini Twins class on the John and Nigel Reed backed SV taking the big points away from Tom Blackwell and current series leader Alan “Mr A and R Racing” Russell who had made the overnight dash from manning the racing spares business at Oulton Park!! Tom Blackwell also runs a second SV in Newman Stallard colours in the Super Twins and left Combe with an increased series lead after two runner-up spots behind Murray McConnachie and William Holland. The Sound of Thunder class was more like the Peter Carr and Sam Thompson show. Both on 675 Triumphs, there was nothing to choose between them. Thompson took both wins and a new lap record on his Vapourtrails of Yeovil triple, but the timekeepers had to go to three decimal places for split the pair as there was just 0.001 of a second between them at the line in main final. The two runner up spots were enough to see Carr the reigning class champ get to the top of this years table over the absent Jonathan Railton. The so far dominant Andy Blomfield was just slightly off his game this weekend and that allowed two new first time 2016 winners to grab the 25 points as Paul Payne and Steve Mason took the flag first in the Desmo Due A class finals. The B class for the 600’s saw another two wins for Peter Pritchard, no mean feat when you think that he started form the back of the grid after falling at the notorious Bybrook chicane in the qualifier. Tom Williams looked to be on for another double win in the 700 Streetstocks after taking a convincing win in the first outing, but he took a high speed tumble in the second leaving the way open for Eddie Whitehurst to extend his series lead in his EAW ZXR636 Kawasaki. The 1300 Streetstock were hectic affairs with Paul Jeffery (…who was celebrating his Wedding Anniversary!!!) taking one win and Richard Hughes the other, Hughes’ win also saw him take the class lap record. Novice rider Stephen Martin took stunning runner up spots both days. Nev Jones and Tom Bryant took both sidecar wins on the Lincoln Refrigeration LCR1000 Suzuki to now lead the 2016 CSC Sidecar series. Both wins were over Jon Bicknell and Andy “The Racing Preacher” Haynes with Dean Nicholls and stand in passenger Kenny Cole taking a pair of thirds in the 600cc Certain Exhibitions LCR. Nev and Tom also picked up the Ralph Allen Press Trophy for their troubles. The newcomers had a baptism of fire at the notoriously difficult to learn Wiltshire circuit, as their race was help over from Saturday, and run first thing Sunday morning. The 500 class went to Tom Harrison, the Mini Twins to Jake Dettloff and the Open to Stephen Martin on his Neil Pearson ZX10. All three a fast learners as they all set new class lap records!! Series leader Jon Wright finished third in the first outing in the 700 pre-injections on his CBR 600 behind winner James Griffiths and Andrew Thorne, but bounced back to win the second outing by less that half a second over Griffiths. Not bad when you think that Wright had blown two engines and had a midnight oil burning rebuild on his CBR…..it is a mark of his main rival that James Griffiths helped Wright and the team into the night to ensure he could get out on the grid…. Sportsmanship indeed. Former two time champ in the 1300 Pre injections and current series leader Adam Jeffery grabbed one win and 25 points in Saturdays outing but had to settle to 16 pints for third on Sunday as Lukasz Gaslawski piped his for second, but neither was a match for Neil Sutton. 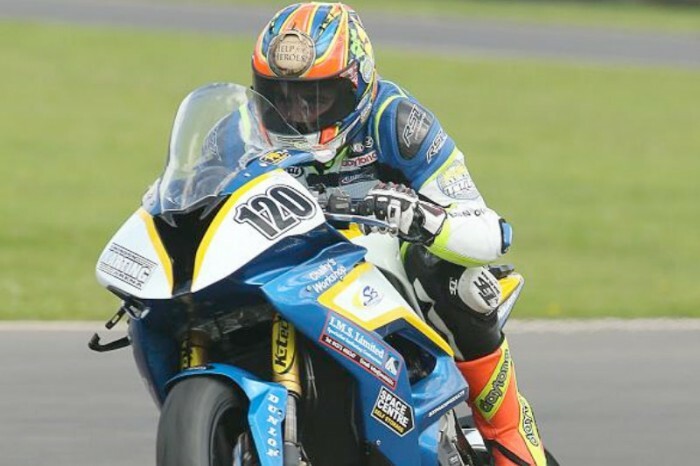 Sutton a Castle Combe track day and race instructor has not had a competitive race for over 15 years, but he and his elderly ZX9R Kawasaki took a 12 second win in the last race of the weekend…. once a racer….. always a racer !!! During Saturday’s Open Final there was a racing incident involving a number of riders, one of who was Jer Thomas. Jer was treated at the circuit and subsequently airlifted out via the Wiltshire Air Ambulance service but sadly succumbed to his injuries later that night. Castle Combe Circuit and NG Road Racing extend sympathies to Abbi, Rebecca, Caitlin and all family and friends.